A Twitter exchange between Donald Trump, and late-night chat show host Jimmy Kimmel saw the comedian promising to give his show to the president is he agrees to leave the White House for good. "Excellent point, Mr. President! 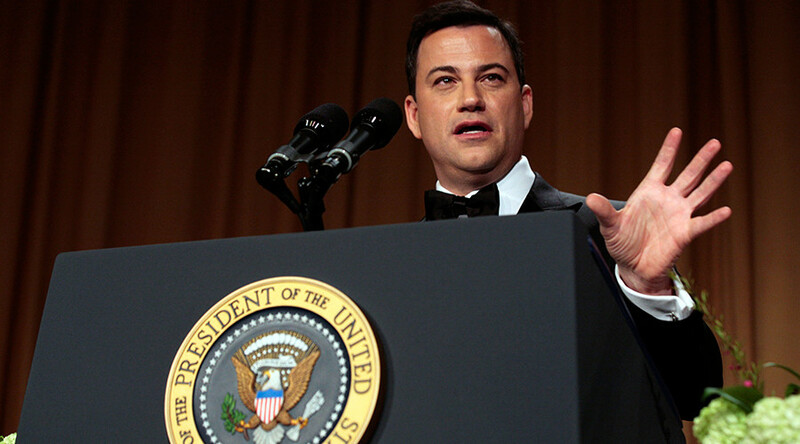 You should quit that boring job - I'll let you have my show ALL to yourself," Kimmel tweeted Saturday. — Jimmy Kimmel (@jimmykimmel) 7 октября 2017 г. The offer came in response to a series of tweets in which Trump slammed ABC’s ‘Jimmy Kimmel Live!’ and other late-night shows over their constant attacks on him. "Late Night host[s] are dealing with the Democrats for their very 'unfunny' & repetitive material, always anti-Trump! Should we get Equal Time?" he wrote. "More and more people are suggesting that Republicans (and me) should be given Equal Time on T.V. when you look at the one-sided coverage?" the president added. Earlier Saturday, Seth Meyers, of NBC’s Late Night, also offered air time on his show to Trump in response to his complaints. — Seth Meyers (@sethmeyers) 7 октября 2017 г.